Luxworks is a design studio specialising in design and illustration for print. Working on all sizes of jobs S/M/L/XL from a small but perfectly formed pin badge design to a multi page magazine or brochure, up to a swaggering branding project. All of the illustrative work on the site was produced in-house - illustration fuels the Luxworks engine so get in touch if you require bespoke illustrative work for your project. Established for over a decade, I have many happy clients and love graphic design and illustration as a hobby, as well as a very enjoyable job. The creation of beautiful, well crafted design is the industry behind Luxworks. Providing an affordable and approachable design service, I can work with you to meet your budgets and direction. I am happy to source print quotes for your job should you require them and can advise on different papers and printing processes that best suit your job and budget. I can come to you if you would like to discuss a project in person, or just send an email/make a call and I will provide you with a free, no obligation quote. Available for short or long term contracts or one-off projects. I have a valued group of efficient artworkers and an excellent photographer with whom I work closely, if a larger scale project demands a bigger team. After seeing a Luxworks flyer design, Julie was invited by Louis Bou (designer and author) to contribute work to his book about flyer design, Flying Graphics. 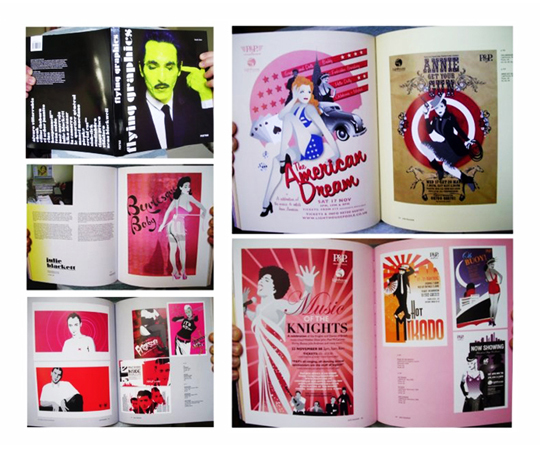 The book brings together twenty of the most creative and original graphic artists to explain what designing flyers means to them. An article was written about Luxworks for this magazine, circulated on private jets. 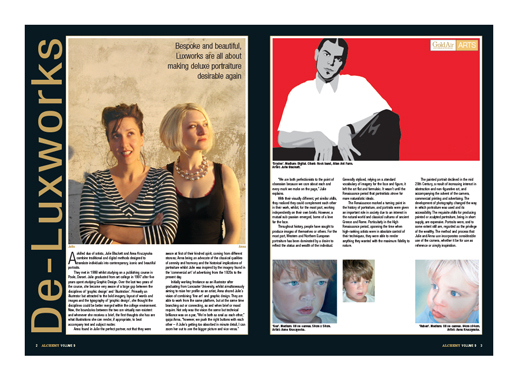 The editorial focused on our portraiture work including the work of Anna Kruczynska, an accomplished oil painter who has worked on storyboards for film right through to large scale contemporary portraits.